India on Sunday successfully test-fired the underwater ballistic missile, K-15 (code-named B05), off the Visakhapatnam coast, marking en end to a series of developmental trials. 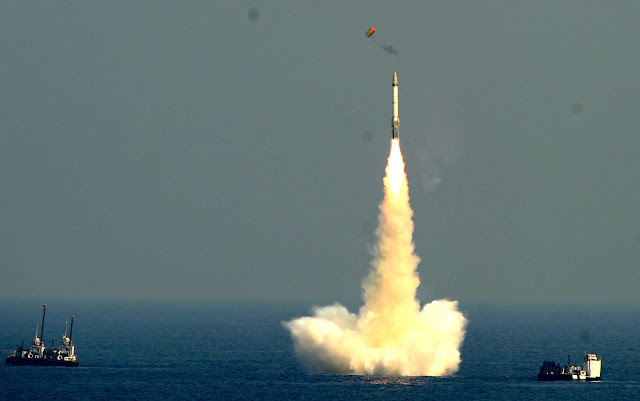 In its twelfth flight trial, the 10-metre tall Submarine-Launched Ballistic Missile (SLBM) lifted off from a pontoon, rose to an altitude of 20 km and reached a distance of about 700 km as it splashed down in the waters of the Bay of Bengal near the pre-designated target point. According to scientific advisor to the Defence Minister V.K. Saraswat, the missile was tested for its full range of 700 km and the mission met all its objectives. He said the impact accuracy of the medium range strategic missile was in single digit. With the completion of developmental trials, the process of integrating K-15 missile with INS Arihant, the indigenously-built nuclear submarine, will begin soon. As many as 12 nuclear-tipped missiles, each weighing six tonnes will be integrated with Arihant, which will be powered by an 80 MWt (thermal) reactor that uses enriched uranium as fuel and light water as coolant and moderator. India is only the fifth country to have such a missile -- the other four are the United States, Russia, France and China. Meanwhile the reactor has been integrated with the submarine and it was expected to go critical in May/ June 2013. Once that was done, the harbour trials will begin. Besides Arihant, three other nuclear-powered submarines were being constructed -- one at Visakhapatnam and two at Vadodara. India is also developing K-4 missile with a range of 3,000 km.